If ever a car company read the social climate and the desires of buyers dead on, it was Ford, and their moment of true brilliance was the Mustang. The Ford Mustang galloped hard into America and the world’s collective conscience 50 years ago. The anniversary celebrations are set to go on all year long, culminating in the showroom release of the revamped 2015 model sometime in the Fall. The new car is a good-looking and technologically advanced update and excited buyers are filling up the dealer pre-order books. All of the sixties-era Mustangs are desirable cars, none more so than the fastback versions. They were compact for the time, and like every car worth a longing glance, looked fast sitting still. Importantly, in the racing-crazed sixties, their rumbling V-8 hearts made them winners on the dragstrip, the speedways and out on the open road. Chrysler and GM could only scramble to catch up in this new “Pony Car” market. And this might be the coolest and meanest Mustang ever. 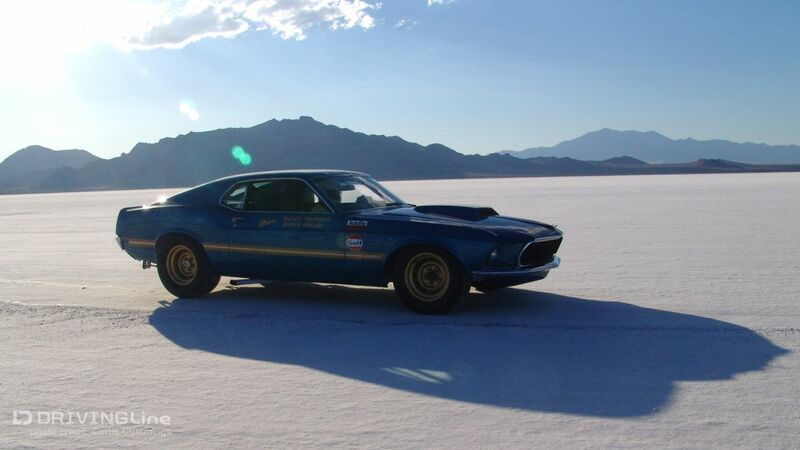 Mickey Thompson was obsessed with setting records and in love with the Bonneville Salt Flats. He’d been a serious contender there for years, and in ’59 had been the builder and driver of the first car to ever break 400mph. In the sixties, Ford was extremely active in motor sports and wanted to make a statement using their new for 1969 Mustang Mach 1 to break as many speed and endurance records as possible. 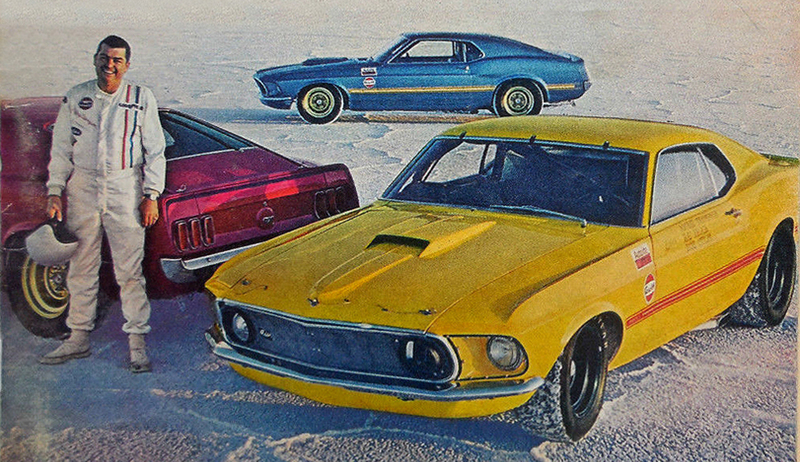 Mickey and all three Mustangs from the cover of Hot Rod, October 1968. They gave Mickey three new cars that had been built by Holman-Moody for NASCAR’s Baby Grand American Series, which ran a small number of races for pony cars. In July of ’68, a small caravan of vehicles arrived at Bonneville, ready to re-write the record books. Out of the trailers rolled the three prepped cars, one red, one yellow and one blue, each with different configurations for different classes. The yellow car was set up with a Tunnel Port 302 intended to pull the Mach 1 for 24 hours and wreck every record in the books along the way. The red car was used mainly for test runs. The blue car featured here, rocked a NASCAR Tunnel Port 427 and was intended for straight line glory. Micky had brought along heavy hotshoe Danny “On The Gas” Ongais as co-driver as well as a couple of journalist guest drivers that would guarantee him plenty of press coverage. They set up a 10-mile oval on the salt, fired up the yellow small block car and went to work. They hit the salt running, knocking down Class C (183-305ci) records like dominoes until conditions on the salt and a couple of minor mechanical breakages forced them to call it quits. The hard-charging yellow car had averaged 159.556 mph for 500 miles. 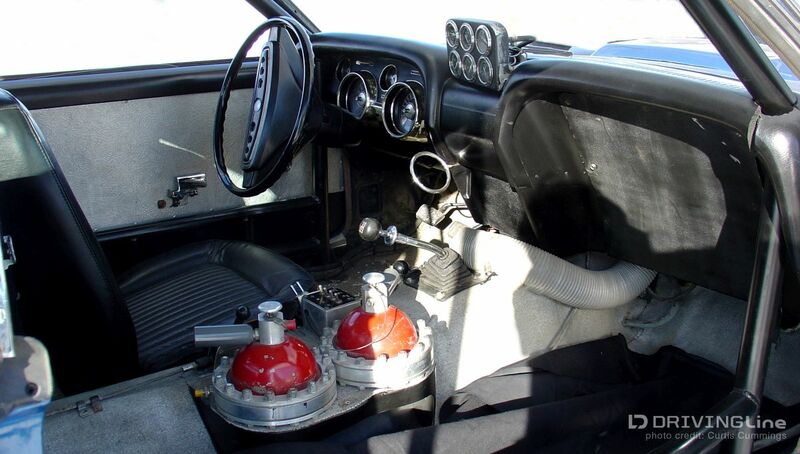 Returning to Bonneville in September, and with the 24-hour endurance record in their sights, the group of hot-rodders gassed up and set out to shake some salt. Conditions were good, and 24 hours later the yellow car crossed the line averaging 157.663 mph, decisively breaking the record. Then it was time to get the blue big block out on to the straight course. By the time they were finished, 27 Class B (305-488ci) records had fallen to the thundering blue Ford. At the end of the week, they packed up, smug and satisfied, having set an incredible total of 295 endurance and speed records. The yellow car has since disappeared, probably worn out from the abuse on the salt. It is believed that the red car was raced and wrecked by NASCAR legend Bobby Allison. The blue Mach 1 stayed with the Thompson family until it was recently sold- along with the yellow car’s Tunnel Port 302- to a prominent Midwest collector. It survives as not just a historic record breaker but as a one-of-a-kind transition car. During restoration for the new owner, the uniqueness of the car was fully realized. There are no date codes on the body panels. None of the glass had proper stock markings. The unnumbered hood scoop resembled the later Boss 429 scoop, but was likely a prototype. Paper work was found, canceling a NASCAR 429 build by Thompson. As far as anyone can tell, this chassis is likely both the first ‘69 Mach 1 that Ford built and the first Boss 429 ever put together. It is doubtful that there is a more rare and pedigreed and just plain badass Mustang anywhere. The perfect stance. The plain, gold painted wheels. That fastback profile. Everything about it shouts muscle and power and rightness. Of the three cars, the blue car- this car- is the only one left. With 50 years behind it and a strong new version on the way, the Mustang is poised not just to take on GM’s Camaro and Chrysler’s Challenger, but to set a higher standard for American muscle cars and to bring the fight to foreign makers competing on a global scale.